Nine MEPs have urged European Commission president Jean-Claude Juncker to reconsider his promotion of Guenther Oettinger to a sensitive EU portfolio. The appeal came in a letter on Thursday (5 January), a few days before a European Parliament hearing on Oettinger’s new post. The German EU commissioner is to take over the budget and human resources file, which was vacated by Kristalina Georgieva, who left to work for the World Bank. The post would make him responsible for EU officials’ proper conduct and for transparency and could see him crowned a commission vice-president. But the MEPs said his “recent actions” were “not appropriate behaviour for a commissioner and breach the Code of Conduct for commissioners”. They were referring to his racist, misogynist, and homophobic remarks at a dinner with German businessmen last October and to his flight, last May, on the private jet of a German pro-Russia lobbyist. Oettinger later apologised for his comments and denied wrongdoing on the jet incident. They added that his racist remarks could harden feeling against minorities, as “prorogued by certain political leaders and parties” in Europe. Dennis de Jong, Benedek Javor, Ana Gomes, Soraya Post, Cecile Kyenge, Jean Lambert, Cornelia Ernst, Ulrike Lunacek and Daniele Viotti signed the anti-Oettinger complaint. Several of the MEPs, who hail from left-wing and green groups, serve on committees that would oversee his new dossier. One of the signatories, Javor, a Hungarian MEP, told EUobserver he doubted that Juncker would change his mind. But he said the commission president should not treat Thursday’s complaint lightly. “This letter is a last signal to the EU commission that its attitude and inaction with regards to Oettinger’s controversial behaviour is unacceptable,” he said. A group of NGOs, also on Thursday, piled on the pressure in a separate appeal to Juncker to drop Oettinger’s promotion. The controversy comes amid a broader popularity crisis for EU officials. Juncker himself is in the spotlight for shady tax deals in Luxembourg. His EU predecessor, Jose Manuel Barroso, was recently shamed for becoming a lobbyist for a US bank. The EU’s former competition chief, Neelie Kroes, also received a “reprimand” for lobbying. Oettinger will be quizzed on Monday (9 January) in a 90-minute hearing by MEPs from the EU parliament’s budget, budgetary control, and legal affairs committees. MEPs will then file an opinion to the parliament president and group leaders, who will discuss the issue on 12 January. The Oettinger hearing is a softer version of normal procedure. New commissioners usually face a three-hour grilling with a secret vote at the end, but Oettinger will face an “exchange of views” with no vote. Javor, the Hungarian MEP, who originally exposed Oettinger’s lobbyist jet trip, said it looked as if the parliament chiefs wanted to give the German politician an easy pass. He said new rules coming in in January would have prevented the soft format. “My feeling is that they [parliament president and group leaders] pushed for a quick and early exchange of views to avoid a comprehensive hearing,” the MEP told EUobserver. 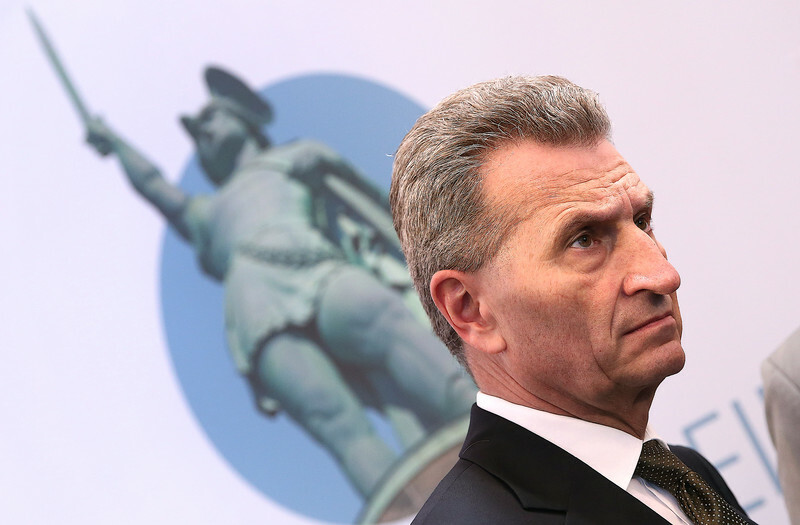 Oettinger, a 63-year old Christian Democrat from Bavaria, a German region, said in October that Chinese people had “slant eyes” and insulted women and LGBTI people. He has already responded to some pre-hearing MEPs’ written questions. He never sent a letter of apology to the Chinese mission to the EU, but he said he was sorry if his words “gave rise to the impression of disrespect for the people of China”. He also promised women that they would represent 40 percent of commission managers by 2019. On the private jet incident, he defended his decision not to declare his trip with the German pro-Russia lobbyist, Klaus Mangold, as a lobbyist “meeting”. He said that the Hungarian government organised the plane trip with Mangold, which was not a “meeting” because neither he nor Mangold had requested it.